In the law of the gun, a man must shoot his way to innocence. At least that’s how Captain McKelly of the Texas Rangers puts it to Buck Duane. On the run for killing a man to save his own skin, Duane must now infiltrate the deadly Chelsedine gang. These ruthless rustlers are running amok in Texas and it’s going to take a matchless gunfighter to stop their rampage. With the legendary Rangers providing firepower, Duane has more than a fighting chance. Or so he thinks. When he uncovers a secret that could destroy them all, the bullet storm is biblical–and a legend rises out of the dust. I absolutely loved The Lone Star Ranger. 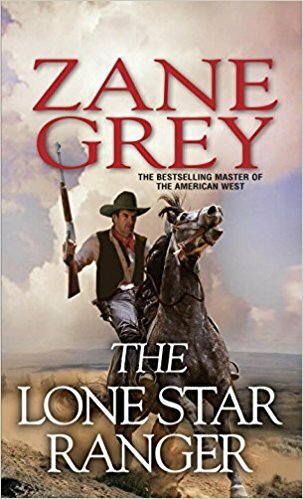 I have not been that impressed by Zane Grey’s other books that I have read, but this was a sure winner. I was not entirely sure of the book for about the first eight chapters, but after that I could not set it down. The story line is fascinating and has many different elements. I was also in a western mood which may have helped me enjoy it a wee bit more. I cannot wait to read more of Zane Grey’s books after reading this one.